Langfield on Not a Sage on the Stage, Not a Guide on the Side: Who Am I? Lakendra Theodoratos on Not a Sage on the Stage, Not a Guide on the Side: Who Am I? I just came across this new social network, designed specifically for students and teachers, for interacting “after class’. and an interview with the networks creator, ceo Jon Corshen. I have had one other online course (so I could get certification as a Medical Assistant to help my husband build his practice and to be able to see patient charts for billing). The instructor just posted a 1 page document (weekly) and then we were to take a multiple choice quiz. It was pretty low-level. I did 10 of these and I didn’t feel like I learned much. It was basically paying for a certificate so I would not violate HIPAA. I have learned a lot from this class but feel as though I really need to review all the material again to be able to incorporate more of the approaches into my courses. I am inspired to create exciting learning opportunities for students and see that there is much to be done. There is definitely a lot to absorb and some learning curves involved but I look forward to the discovery and implementation. In terms of tools that have taught me the most in online classes (including this one! ), I would say that narrated lectures, the opportunity to have peer-to-peer interactions, and independent reading were the most effective ways that I was engaged. I did like the use of quizzes and other content like this, but as a “Millenial” (and ugh, do I ever hate labels like that! ), I find myself trying to “clock” the game in the shortest amount of time possible, instead of focusing on what lessons I should be learning from the exercise. With the narrated lectures, as Sharon and Karen were saying, I can definitely see the advantage of keeping these shorter from a student standpoint (even if more total powerpoints were needed in order to encompass the material). It is actually quite challenging to find a fifteen minute block of time just to sit still and watch a lecture, so I imagine anything longer would be even more difficult for students to manage. However, it is amazing how much more engaging having a narrated powerpoint is over just reading a flat text file. The peer-to-peer tools are excellent – I’ve learned a lot from our discussion board forum using the experiences of other instructors in the class. I prefer discussion board to the blog format, because it feels like you can see the interaction between different thread topics more easily…as clunky as the discussion board is when people get very active posting, it seems like it has more “flow” and interaction than the (reasonably) static blog format. Reading, I think, has a similar purpose to on-campus classes. Allowing students to explore material on their own at their own pace seems like an effective learning tool. I guess the main thing here is that I need to check the material regularly to make sure nothing more relevant (or more readable) has come out for the topics of the course. Anyway, that’s my two cents on what I found the most engaging tools in this course. As to how I will engage students? I’m hoping narrated lectures, using multimedia for labs, and “high-grading” for more interesting assigned literature will “hook” them into the subject of Whales and Whaling. 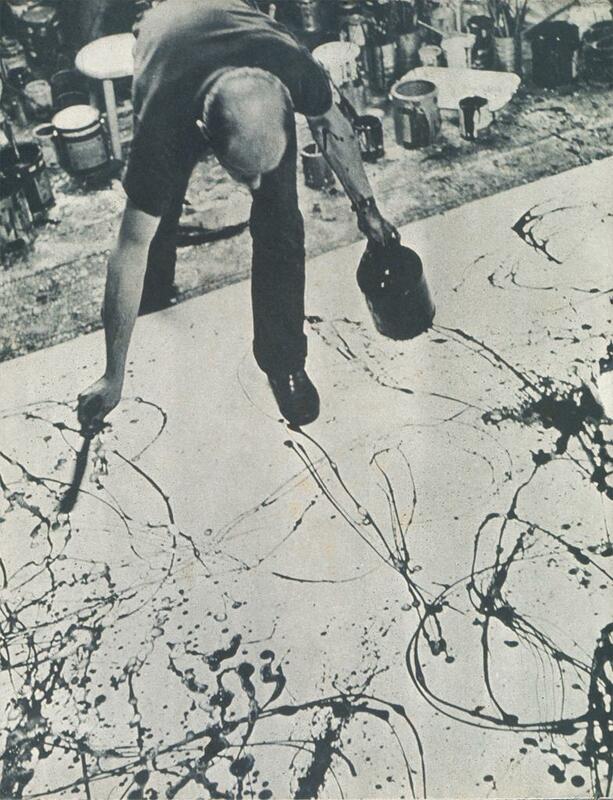 Working in East Hampton Studio, Jackson Pollock, 1951, An ARTstor image, copyright protected. Like others have mentioned in the last several posts, I was thrilled and surprised with the outcome of the webquest activity. I went through all the links shared in the assignment directions and took notes whenever I found something I thought could be useful to students in my course (Writing Art Criticism). Students in my classes cover a broad range: seniors majoring in art and students from other departments that haven’t a clue; those who have a proclivity towards writing and those who (as Sara pointed out) haven’t even had the college’s basic writing course. One thing I can say though, is I how surprised I’ve been by everyone’s enthusiasm to learn about art, either to add to what they’re already familiar with or to brave what seems completely foreign to them. Basic writing skills and art history aren’t part of the teaching goals in this course but the broad range of students required that I be ready to offer help to those who are struggling. The easiest way to do that was to begin collecting links to online sources, both about art and writing. Some are from the sites mentioned in our assignment. This assignment gave me even more sources from which to gather content materials. In an effort to level the playing field for students, I keep a collection of online resources in addition to course work to help those who aren’t as familiar with art as others. As things come up in a discussion or while going over their papers, I suggest they check out specific links in the folder. Non-art students are sometimes intimidated by art, so I spend the first 3 weeks doing quick short assignments for the reason (among others) that it gives me opportunities to calm their fears. Here are some of the links I found, both from this assignment and some I already had before. If anyone is interested in a full list, let me know and I’ll send. Note: I’m trying to embed the videos, but, in case I fail, I’m giving you the links too. TED: I came up with some excellent treasures! I consider these exceptionally good for several reasons: it’s the artist themselves talking about their work in a relaxed friendly way, they all have a quirky story, and they only last 15 minutes each! This is also from TED. At times, when a student is from another field I send them a link to an artist who is working in that field. People still only see art in the traditional mediums (painting, sculpting, architecture…) I am very excited to find this gem tonight. These were links from surfing Merlot.org. I have access to ARTstor, but my students don’t. I was happy to find out that Valley Library has amazing art image resources for both me and students, then I found a couple more. Web Gallery: http://www.wga.hu/index.html When you go to many of the images on this site, there is often music playing from the same time period. Besides that (as if that weren’t enough), it has the option “dual mode” for viewing two works side-by-side. This was the grandest and most useful discovery I made from this assignment! Kahn Academy has an extensive collection of Art History videos, but the quality is amateur from the ones I saw. I could see potential for using it to create my own, or as an assignment for students. While I’m on the subject of creating my own: it was useful to see the various ways other educators are using Flickr. Youtube Edu: I’ve searched through it before and, like before, didn’t find anything that I liked. I’m interested in Almagest but couldn’t figure out how to get to the non-member material. Later will try some more. Ways of Seeing, John Berger, the entire documentary in several parts: http://youtu.be/LnfB-pUm3eI (I warn students that this is an older film and Berger looks like the hippie Marxist that he still his. The content is valuable and worth helping them look past this. Art Fag City is an online journal http://www.artfagcity.com/ and also produces short films about artists for Youtube http://youtu.be/lhMdl0vEczo. A student shared this with the class a couple terms ago. It was a great find! I like that the style of filming is up with the times and the artists tell their own stories, and they’re all less than 4 minutes long but packed with interesting useful information. 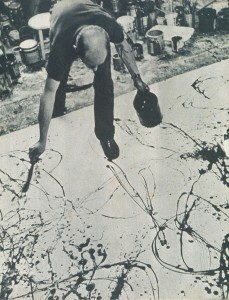 Students are writing about contemporary artists so this is a great source for them to choose one they find interesting. I think I inadvertently saved the best till last: the incomparable Ubu Web, created by Kenneth Goldsmith, houses the largest collection of avant garde sound, film, video, and writing on the web. Their book mentions a lot of artists and works but for many there’s no image provided. I am putting together a folder that will have at least one work by all the artists mentioned to give them a visual of what the book is talking about. Much of the content in my film music history class depends on being able to hear and see the examples. I am always combing the internet for new content and appreciate the list that was set up by Shannon. I have enclosed a podcast series on the use of foley (the use of sound effects in film music). I think students would find this part fun. I would have them listen to this and then pick out fun you tube clips with an historical account of how foley is used in film. Students may even want to use their own cell phones to record foley (and submit to the discussion). I thought this webquest was a great way to start finding materials for the migration and foraging ecology aspects of ‘The natural history of whales and whaling’ course. I focused on TED, Merlot, Youtube.edu, Wolfram Alpha, NPR, MoOM and Itunes U. 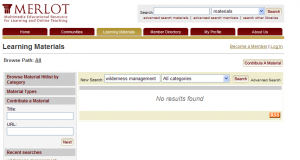 The three least useful search engines (for me – they work fine in other subject areas!) were TED (no content), Wolfram Alpha (which tends to interpret the search query much too narrowly for biology-related questions) and itunes U (full of movie trailers). I got a LOT of hits at youtube.edu and NPR using the search terms “whales OR whaling”. This is excellent, because I was hoping that multimedia would be available. MoOM looks as though it may have had a few useful resources, but I found it hard to work out how to search this site. In the end, I went to the archives and used my web browser to search for the word “whale”. When I clicked on the links, nothing happened so I had to right click to open a new window which might not be as intuitive for less web-savvy people. I did find this:http://www.wdcs.co.uk/media/flash/whalebanner/content_pub_en.html which might be useful for highlighting some of the adaptations in the cetacean evolutionary lineage, such as really large sizes. Merlot also had a resource on whalers which I’ll be looking into more detail in after looking at all the other links I’ve turned up! I’m beginning to have an idea that perhaps for the week where I was going to provide the students with multimedia of cetacean feeding strategies, that instead I could set up a webquest for them. This would allow the students to focus in on the species/feeding strategies of greatest interest to them (I’ll be giving an overview of the strategies in the “canned” lecture, so different kinds of strategies won’t be completely overlooked just because they aren’t the student’s favorite). Because I know that there is a fair bit of material out there from the searches I have just done, I feel like I wouldn’t be leading them down a complete dead-end, and I wonder if they might feel a little more engaged if they have to go out and search for examples themselves. This would also make the activity a little more accessible to students with disabilities, because they could select samples which were not necessarily multimedia. This exercise also highlighted to me the importance of ongoing efforts to keep “an eye out” for resources e.g. I knew Te Papa, the Museum of New Zealand, had an excellent exhibit on whales, and searching this I found several multimedia items that should be really useful for my class, including this one: http://blog.tepapa.govt.nz/category/pygmy-right-whale/page/3/ . If you start at page 3 (the link given here), and work your way backwards, you can see the blog and photos associated with a pygmy right whale necropsy! Right away I was skeptical about finding online content that is really relevant to my Environmental Law class. Of course, there are so many things about the environment out there, but it sounded like a bit of a long shot to find really targeted and effective content that speaks to the narrow topics in class, specifically about law or policy (not just cool science) that is at a level appropriate for undergrads. Or would take a long time to sift out, and heaven knows that I just don’t have the time. 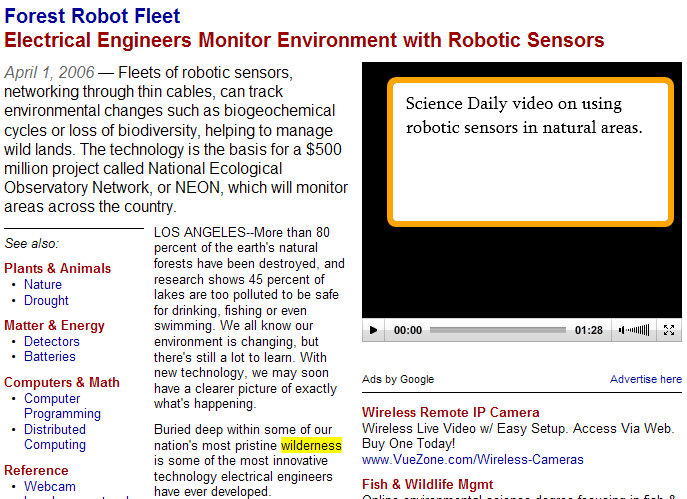 I am familiar with TED content from personal use, so my first step was to browse the “Environment” tagged videos. Most were too science and application oriented for my Environmental Law class, but I came across a TED debate on nuclear energy right pretty quickly (http://www.ted.com/talks/debate_does_the_world_need_nuclear_energy.html). Using outside content is helpful because (a) Some people (much smarter than me) have thought very hard about these issues and can say it faster and better than I can, and (b) I can’t provide a debate in my class when it’s just me! Giving them a different perspective of both content AND process is incredibly valuable. Especially when we are dealing with highly controversial issues, such as whether we should be encouraging expanded use of nuclear power. The web is an amazing resource, but as I get older I notice that I am now teaching people who have only known on-demand media and I realize how much it has actually narrowed our world in some senses. We all have the ability to search out the material that confirms our own perspective, and we don’t have the patience to sit through the material that challenges our perspectives. I think that dynamic is reflected in our highly polarized society, and it is only going to get worse. With a resource like a 20-minute TED debate, we MUST listen to both sides, and if I can get my students to even look at the other side of a debate, I consider that a hit. If they took the steps to seek out more information about the other side, that is a home-run. So maybe I should do a little before and after essay with this—a paragraph about your opinion on the use of nuclear energy before watching the debate, then a paragraph arguing the other side after watching the debate! One question that I am thinking about as I continue to seek out media: Is it credible to pull media primarily from 1 resource, like TED or another site? Or should I make a concerted effort to bring in resources from different places? And how much? Ok, I’ll admit up front that I did not devote what one could call ‘quality’ time to the webquest assignment involving zunal.com. That is, unless keeping one eye on the monitor and one eye on my son’s homework can be called ‘quality’. But hey, such is life. Something tells me many others out there deal with these same quality issues. In a way, restricting the activity to simple searches on a handful of search engines was beneficial. It revealed how restrictive it is to use only general words or terms. In my case, I used the word wilderness, or term wilderness management. In future searches, I would be a bit more specific about the topic I’m seeking help with. Rather than simply using wilderness, I’ll try wilderness recreation, wilderness and fire management, or something similar. 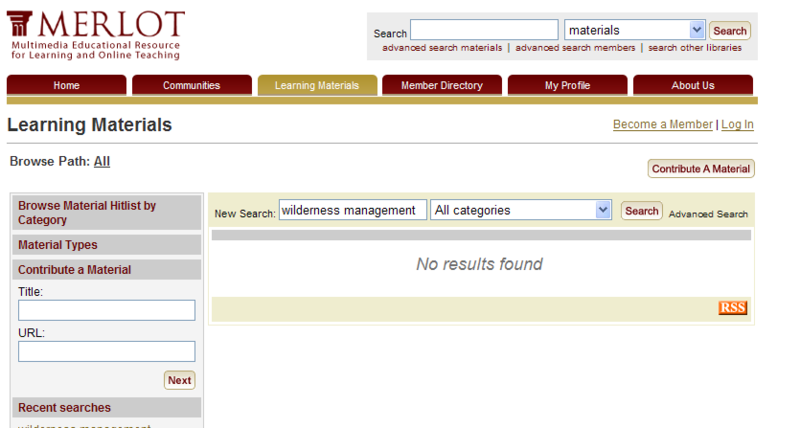 I was reminded of how liberally the word ‘wilderness’ is used in science and natural resource circles. It is seemingly used to refer to a variety of lands containing some type of wild character. Even in the Science Daily reference, I am not convinced that this technology would actually be used in wilderness areas. The Wilderness Act of 1964 mandates that no mechanized use be allowed in wilderness areas. There are caveats of course, but I don’t believe this is the case with the technology referenced by Science Daily. In today’s technological societies the Internet prevails. Almost every email, website, or file contains links to the world wide web that may supply some extra information, clarify an issue, suggest an interesting sidebar on a topic you’re studying… or contaminate your computer with a virus. So one has to follow the links carefully. I have been greatly pleased with following the links of the webquest activity assigned for our online development class. Having done my grading for today, I decided that I could have a little fun checking out the potential help for creating my class content. I dismissed many of the videos from Ted as a bit too socially conventional for my courses, lost patience with sociology.org, but was pleased beyond belief with what following the links allowed me to discover. …I have to admit, I did not finish this activity in one sitting. As I went through the tutorial, I was clicking on the signs on the slides – letter I for information that appeared on a slide, a little globe for a link outside the tutorial – and I clicked – and made it to this activity. If you are interested in what I have found, try it out for yourself, and prepare for a challenge – this is an activity that is impossible to get right! At least, I think so. I bet it could be pretty fun for the students to start from trying to assign a face to a census category and end up finding out about the social construction of race and the realities of racism. I could not believe I found an activity that is so perfectly aligned with the content of my course – I even have a reading on the history of the census that my students read already. With this activity, I am sure, I will get responses for the topic that are much more alive. I can’t wait. I’ve been thinking quite a bit about engagement over the last few months… engaging distance students in learning, yes, and also engaging them in the greater learning community of Oregon State University. I’ve got a lot rattling around in my head, and if you spend too much time with me, I’ll drag you into the conversation, too. Lately, in meetings with Ecampus– from student support to course design to administrative folks – we’re discussing ‘what now?’ and ‘what’s next?’ Working with the Academic Success Center, I’ve been developing the success strategies and engagement goals for the orientation course I’m developing. And anchored in Career Services, I am working to make our campus-based events and resources accessible online. 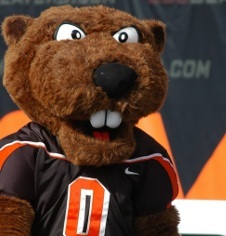 You see, I’m pretty interested in how each of us has the opportunity to engage the distance learner at OSU. I am curious how others at OSU and other institutions are already meeting the need in innovative ways and where the potential exists to do more. It used to be that the weight of taking online courses, whether for professional development or to complete a degree rested overwhelmingly on the student’s shoulders alone. The student needed to muddle through the details and jump through the hoops without much support. But technology and global sophistication offer us the chance to connect, to increase access, and to bring the campus to a larger population in engaging ways. What was once luxurious in education is now indispensable. Designing courses that encourage community building has become essential. And to connect with our students, it is important to understand who they are. What did The Voice say, “if you build it, they will come”? The gender gap is closing. The average age is lowering. “Traditional” on-site students are beginning take on less-traditional roles, and they are turning to online courses as a viable alternative. In distance education, it seems the classroom continues to be the common denominator for the changing population. As instructors we have to enlist the best practices of both pedagogy and technology to create an environment where best learning can occur. But what about communication… can interaction between students / between teacher and student be any good online? My experience says it can be better than in traditional classrooms. Can technology help engage rather than add a layer of anonymity or frustration? My experience so far, with toes just dipped in the water, says it can make all the difference. And there is a lot to learn from the way we work with on campus students: How can mentoring programs work with distance students? What about opportunities from a distance to participate in research and campus events? Can student involvement extend to distance students? Internships… how can we better support students who are seeking internships in their communities and help them unpack their experiences in a way that enhances their education? Success in the classroom, whether on-site or online, depends on creating access, engaging the learner in meaningful ways, and connecting their learning to real meaning. When our instruction is at its best, I expect the impact goes beyond the classroom. We can begin to engage students in our classes, and then without even breathing too hard, I believe that very soon our students will demand more and we will demand more of ourselves. I warned you about spending too much time with me, so if you got this far… thank you for hanging in there.